Founded in 2008, the wood mill takes in around 450,000 atro tons of log timber annually for chipping and processing into HDF substrate board. The Fiberboard GmbH HDF plant and the CLASSEN Industries GmbH laminate plant thus form a combine: HDF board is transshipped directly to the affiliated laminate plant where it is processed into laminate flooring – around 80 million square meters of it per year. 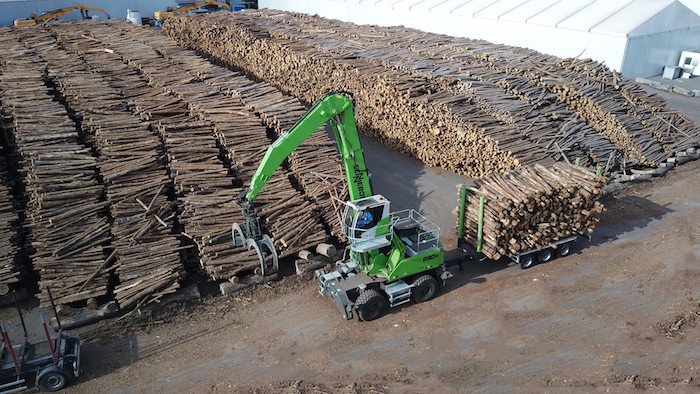 The SENNEBOGEN 830 E material handler is equipped with a powerful 168 kW, emissionstage 4 diesel engine and an especially robust mobile undercarriage with single tires, four-point outriggers and all-wheel drive for greater tractive power. Supplementing the machine is a hitched 50-ton trailer specially designed to meet the customer's requirements.